Historic Preservation: Landmarks Preservation Commission to Act on 95 Backlog Properties Feb 23! GPBA's 12-month campaign to oppose bar license 38 Gramercy Park North at 21st St From 2010-2011, the GPBA led hundreds of Gramercy residents in a 12-month campaign to oppose ...Read more. When the Park is threatened with legal actions, as it has been several times, or when external threats jeopardize the historic integrity of the Park and the surrounding community, the GPBA is the entity that deals with these threats ...Click here to read more. 3) Gramercy Park Hotel Owner Aby Rosen is buyer of $50 million Church Missions House at 281 Park Ave South ...Click here to read more. In 1831, Samuel B. Ruggles set up Gramercy Park and its surrounding lots. He envisioned it as a "free, glorious, open space" that would "bless the City forever." Today, people come from all over the world to experience Gramercy Park. The GPBA, as a Neighborhood Partner to the Historic District Council, is co-sponsoring their 24th Annual Preservation Party featuring their 15th Annual Grassroots Preservation Awards. The Historic ...Click here to read more. A major focus of the GPBA's mission is Historic Preservation and Quality of Life. Therefore, we become involved in all restoration projects in Lot Owner buildings on Gramercy Park. Since many have been inquiring about the scaffolding going up around ...Click here to read more. Tower to become the tallest between Midtown and Lower Manhattan. The tower will eventually stand 60 stories and 777 feet tall. Gramercy Park's historic Players club could soon be forced to find a new home. The club was hit with a foreclosure action last week in Manhattan Supreme Court...Click here to read more. We previously sent an e-mail about hundreds of people meeting to protest a wave of skyscrapers that will cast huge shadows on Central Park. We expressed our concerns about the many tall building developments now encroaching on Gramercy Park ...Click here to read more. Since Gramercy Park is in the Gramercy Park Historic District, a major focus of the GPBA's work is preserving the unique historic residential character of our neighborhood. Toward that end, we are delighted to inform you that our street signs around the ....Click here to read more. The Players club, which for the past year has been struggling to stay afloat after having fallen up to $4 million in debt, has appointed a new president, replacing its longtime leader Johnnie Planco ...Click here to read more. The Players Survives on Gramercy Park! The scaffolding is down, and with new leadership and a Strategic Turnound Plan, the club begins journey to restore financial stability, accountability and trust ...Click here to read more. Do we have a similar threat to Gramercy Park? The answer is YES! On Wednesday, hundreds of people packed the New York Public Library to speak out against a wave of skyscrapers that will cast huge shadows on Central Park ...Click here to read more. After the 18-page Financial Audit Committee report detailing the financial mismanagement under Johnnie Planco's presidency, not only did this board choose to re-elect Planco, but as he continues to tell his lies, they continue to support his presidency ...Click here to read more. Financial troubles put the spotlight on the theatrical community's club as it tries to raise the curtain on a new era ...Click here to read more. Guess what's coming to Gramercy Park? If you think One Madison (23rd St & Madison Ave), the pencil-thin residential tower clearly visible from Gramercy Park is tall, wait until you see the skyscraper planned for 41 East 22nd St where Tamarind restaurant recently closed. The planned building will be almost 150 feet taller than One Madison, currently the Flatiron District's tallest apartment building ...Click here to read more. On December 17, 1831 a deed by Samuel Ruggles established the plot of land between 3rd Avenue and Park Avenue South from 18th to 21st Streets as Gramercy Park. Today one of the priciest and ...Click here to read more. Since Gramercy Park is within the Gramercy Park Historic District, a major focus of the GPBA is historic preservation. We thought the following article in the "Daytonian in Manhattan" describing the extensive history of Nos. 3 and 4 Gramercy Park West might be ...Click here to read more. Our friends at Historic Districts Council need our help! Since Gramercy Park is in the Gramercy Park Historic District, a major focus of the GPBA's mission is historic preservation. Since many of our members are preservationists, we are a devoted Neighborhood Partner of the Historic Districts Council ...Click here to read more. Since The Players sits on one of the original lots laid out in the 1831 Ruggles Gramercy Park Trust, and is an individually designated landmark within the Gramercy Park Historic District, we are deeply concerned about the club and its future. As far as we know ...Click here to read more. The National Arts Club's new president resigned after less than five months at the helm of the 115-year-old Gramercy Park institution that's been mired in controversy, DNAinfo New York has learned. Rev. Thomas Pike, the retired rector from the nearby Calvary-St. George's Church and former city ...Click here to read more. Since Gramercy Park is in the Gramercy Park Historic District, a major focus of the GPBA is Historic Preservation. Therefore, we are vigilant about the condition of The Players' building at 16 Gramercy Park South, which is an individually designated ...Click here to read more. Since Gramercy Park is in the Gramercy Park Historic District, a major focus of the GPBA's mission is historic preservation. Toward that end, the GPBA played an integral role in selecting a developer (Zeckendorf Development) for the preservation and adaptive reuse of 18 Gramercy Park South ...Click here to read more. Since a major focus of the GPBA is Historic Preservation, we are vigilant about The Players, whose 1844 Greek Revival townhouse at 16 Gramercy Park South sits on one of the original lots laid out in the 1831 Samuel B. Ruggles Gramercy Park Trust. The 1890 John Singer Sargent painting of Edwin Booth described below is not the Sargent painting of Joseph Jefferson that the Players ...Click here to read more. Since Gramercy Park is in the Gramercy Park Historic District, a major focus of the GPBA's mission is Historic Preservation. Toward that end, we are vigilant about what goes on at The National Arts Club ...Click here to read more. 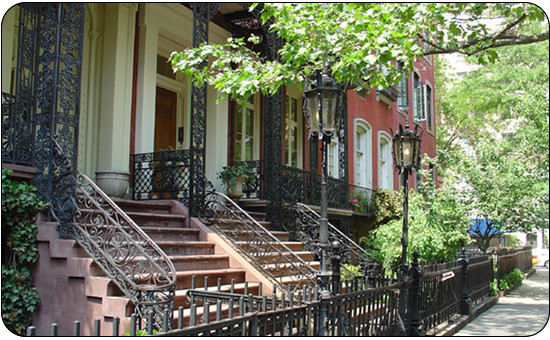 Since 2006, the Trustees of Gramercy Park have been working on all Gramercy Park historic preservation projects with G & L Popian, Inc., the international historic conservation, restoration and preservation firm of Gabriel Popian ....Click here to read more. 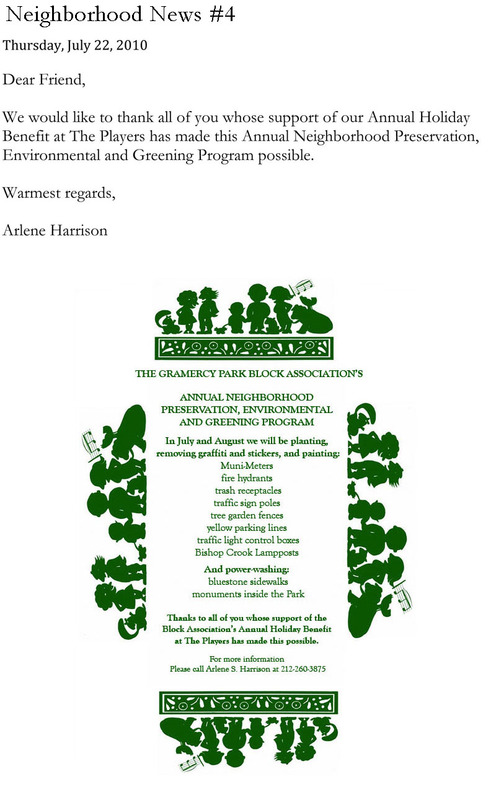 We recently implemented our Annual Summer Neighborhood Preservation, Environmental and Greening Program for the Gramercy Park area ...Click here to read more. Since a major focus of the GPBA is Quality of Life, each summer we implement our Neighborhood Preservation, Environmental and Greening Program. Thanks to all of you whose annual support of the GPBA makes this project possible ...Click here to read more. The Board of Directors just re-elected a President with little credibility, No business acumen, and No business plan in place ... and the $4 million debt continues ...Click here to read more. Since Gramercy Park is in the Gramercy Park Historic District, a major focus of the GPBA's mission is historic preservation. Toward that end, the GPBA played an integral role in selecting a developer (Zeckendorf Development) for the preservation ...Click here to read more. Since a major focus of the GPBA is Historic Preservation, we are a devoted Neighborhood Partner of the Historic Districts Council. Please see below for information about their walking tour of the Madison Square North Historic District. On Monday, July 22nd, newly re-elected Players president Johnnie Planco sent an e-mail to the members outlining some of the many dire financial woes at the club. Many who read the e-mail reacted with ...Click here to read more. For those who still cannot fathom how The Players has fallen into $4 million in debt and has come to be in "imminent danger of closing," all you need to know is the following: 1) Johnnie Planco, who was ...Click here to read more. Since a major focus of our Gramercy Park Block Association is historic preservation, I thought the following testimony which I gave this week at the Landmarks Preservation Commission in support of restoration plans ...Click here to read more. Now that we've finally had success at the National Arts Club, our neighbors have asked for us to update them on The Players. Toward that end, we have just sent the e-mail below to The Players' Board of Directors, and several Committees ...Click here to read more. Many of you continue to be concerned about the financial state of The Players and its future, and so I am including a link to audio of The Players financial report delivered at their June 19th annual meeting by treasurer Giacomo Selloni. The Players Club's historic Gramercy Park townhouse could be put on the market as a drastic measure to deal with mounting debt. Putting the home of famous Shakespearean thespian Edwin Booth, who founded the club, on the market ...Click here to read more. Since Gramercy Park is in the Gramercy Park Historic District, a major focus of the GPBA's mission is historic preservation. Toward that end, we are a devoted Neighborhood Partner of the Historic Districts Council, "the advocate for New York City's historic ...Click here to read more. Since Gramercy Park is in the Gramercy Park Historic District, a major focus of our GPBA mission is historic preservation. Therefore, we are very concerned about the survival and the future of The Players, a landmarked 1844 mansion which is part of the original 1831 Samuel B. Ruggles Gramercy Park trust. We are deeply ...Click here to read more. 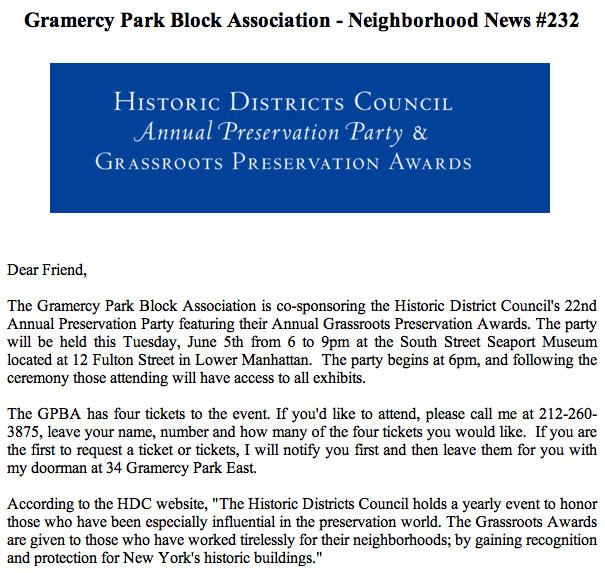 The Gramercy Park Block Association is co-sponsoring the Historic District Council's 23rd Annual Preservation Party featuring their 14th Annual Grassroots Preservation Awards. According to their website, it is a "yearly event to honor those who have been especially influential in the ...Click here to read more. Many of you have continued to express serious concern about the future of The Players. 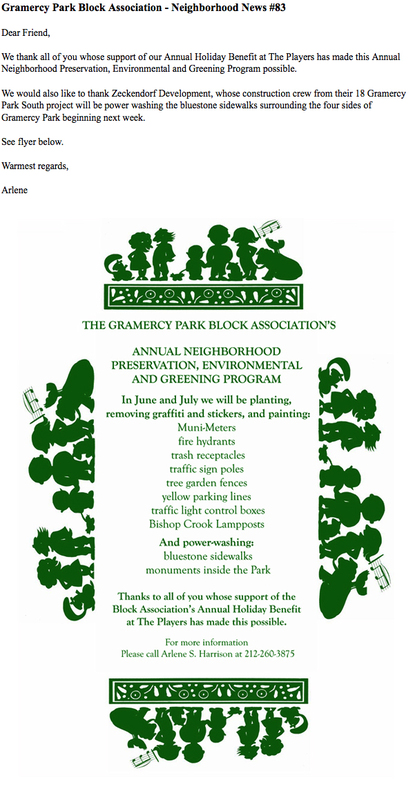 The Gramercy Park Block Association has just reached out to Gary Papush, Chair of Manhattan Community Board 6 Parks and Landmarks Committee, to ask for their assistance in our efforts to ...Click here to read more. The lights might soon go out at Gramercy Park's legendary Players Club - literally. Con Edison workers came to the club on Monday, threatening to shut the electricity off if the club didn't pony up the $8,000 ...Click here to read more. Several years ago, close to 300 members of our Gramercy Park community joined The Players through our Gramercy Park Block Association. Since then, many of you have left claiming "incompetant management" and "extreme decline in services" ...Click here to read more. Help may be on the way for Gramercy Park's bankrupt Players Club, but only is the actors society recasts its lead by ousting its executive director ...Click here to read more. Gramercy Park's famed Players club is in "immiment danger" closing as soon as funds from the sales of its prized John Singer Sargent paintings run out, DNAinfo.com New York has learned ...Click here to read more. We apologize for the last minute notice, but our friends at the Historic Districts Council are inviting us as "Neighborhood Partners" to their 94th ...Click here to read more. The Gramercy Park Block Association is co-sponsoring the Historic District Council's 22nd Annual Preservation Party featuring their Annual Grassroots ...Click here to read the full story. We thank all of you whose support of our Annual Holiday Benefit at The Players has made our Annual Neighborhood Preservation, Environmental and Greening Program possible. ...Click here to read the full story. We are delighted to tell you that the purchase of The Salvation Army building at 18 Gramercy Park South by Will Zeckendorf and his partners has finally taken place. For many months, Reverend Thomas Pike and I, with others from the community, have worked with the Zeckendorf team ...Click here to read the full story. We would like to thank all of you whose support of our Annual Holiday Benefit at The Players has made this Annual Neighborhood Preservation, Environmental and Greening Program possible. ...Click here to read full story. ...Click here to view photo. The Gramercy Park Block Association distributed information to the community detailing the restoration plans for the Brotherhood Synagogue, 28 Gramercy Park South...Click here to view photo. The Gramercy Park Block Association helped the Major at Parkside Residence to navigate the Landmarks Preservation Commission's procedures.Click here to view photo. Alarming architectural and structural conditions at the National Arts Club, caused largely by insufficient maintenance of its glorious Victorian Gothic facade for almost 20 years ...Click here to read the full story. It would be an uninquisitive tourist or a lackadaisical neighbor who hasn't wondered what's going on behind the scaffolding and protective netting that for many months have enveloped the great mansion and its annex...Click here to read full story. Become a fan of the GPBA on Facebook.